NEW YORK (CNNMoney) - America could be crowned the oil world's new king in 2018. The United States is poised to ramp up crude oil production by 10 percent in 2018 to about 11 million barrels per day, according to research firm Rystad Energy. 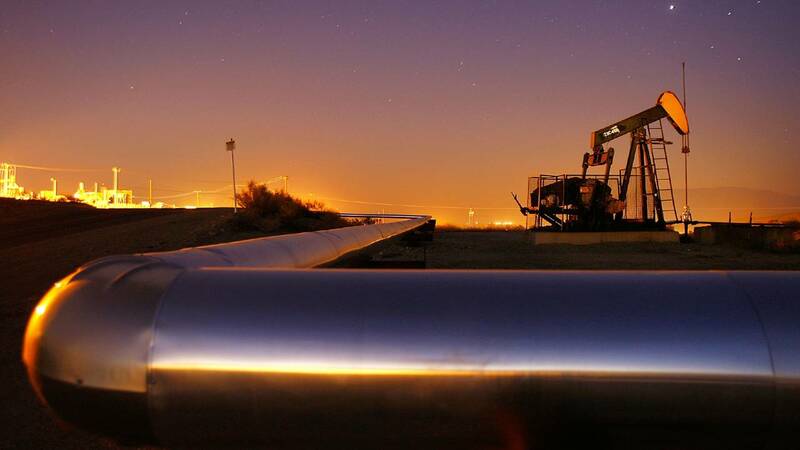 Surging shale oil output should allow the United States to dethrone Russia and Saudi Arabia as the planet's leading crude oil producer, Rystad predicted in a recent report. The U.S. hasn't been the global leader, nor ahead of both Russia and Saudi Arabia, since 1975. "The market has completely changed due to the U.S. shale machine," said Nadia Martin Wiggen, Rystad's vice president of markets. The prediction shows how the fracking revolution has turned America into an energy powerhouse -- a transformation that President Trump has vowed to accelerate by cutting regulation. This long-term shift has allowed the U.S. to be less reliant on foreign oil, including from the turbulent Middle East. U.S. oil production slipped -- but didn't completely collapse -- after Saudi-led OPEC launched a price war in late 2015 aimed at reclaiming market share lost to shale and other players. A massive supply glut caused crude to crash from around $100 a barrel to a low of $26. Cheap prices forced shale companies in Texas, North Dakota and elsewhere to dial back. Domestic output bottomed at 8.55 million barrels per day in September 2016, down 11 percent from the recent peak in April 2015, according to the U.S. Energy Information Administration. But the resilient oil industry, led by the shale hotbed of the Permian Basin of Western Texas, rebounded nicely last year. The comeback was driven by higher crude prices as well as new technology that makes it cheaper and easier to frack. The EIA recently forecasted that U.S. crude oil production would jump to an average of 10 million barrels per day in 2018. That would take out the previous annual record of 9.6 million barrels set in 1970. Rystad Energy is even bullish on American oil. The Norwegian firm sees U.S. crude output hitting 11 million barrels per day by December, narrowly surpassing global leader Russia and OPEC kingpin Saudi Arabia. Others are skeptical. Byron Wien, vice chairman of Blackstone's private wealth solutions group, predicted this week that fracking production would be "disappointing" in 2018, lifting crude oil prices above $80 a barrel. Crude climbed above $61 a barrel on Wednesday for the first time in 2-1/2 years. The recent bump in prices has been driven by a pipeline explosion in Libya and protests in Iran. Bigger picture, the oil rebound has been caused by solid demand and the whittling down of the epic supply glut that caused prices to crash in the first place. A big key behind fixing the oversupply problem has been OPEC and Russia dialing back their pumping. In late November, OPEC and Russia agreed to extend oil production cuts until the end of 2018. The production cuts have helped stabilize oil prices, paving the way for U.S. shale output to ramp up. By contrast, Trump has vowed to usher in an era of "American energy dominance," in part by reducing red tape around oil drilling. Last week, a U.S. safety regulator proposed rollbacks to offshore drilling rules. The Bureau of Safety and Environmental Enforcement, which was formed in the wake of the deadly 2010 BP oil spill, estimates the revisions would slash industry "compliance burdens" by at least $228 million over 10 years. The rule change "moves us forward toward meeting the Administration's goal of achieving energy dominance without sacrificing safety," BSEE director Scott Angelle said in a statement on December 28. Rystad Energy said market forces, not deregulation, has underpinned the upswing in U.S. oil output. "I don't think it's had a significant impact," Rystad's Martin Wiggen said of Trump's efforts to roll back environmental regulations. She added though that there is "not a fear under the Trump administration that he will suddenly outlaw shale." Bernie Sanders called for a national ban on fracking during the 2016 campaign. Regardless of the driver, the ramp-up in oil pumping has lessened the need for the U.S. to rely on oil from unstable places like Venezuela and the Middle East. "The fact that the U.S. produces more oil is a fantastic development in terms of security," said Martin Wiggen. U.S. oil imports have dropped by 25 percent over the past nine years, according to the EIA. At the same time, the U.S. oil exports have flourished since the 40-year ban on shipping crude overseas was lifted in 2015. Exports have more than tripled over the past year to record highs. The U.S. still imports more oil than it exports, but that gap is shrinking.